Block of 6 classes only £150 including clay, materials and firing. Book your class by contacting Carole through the web site, by email or phone. Everything you need to get started is provided and the Hitchin studio is fully equipped with all the tools and materials you require. You can gather together a group of friends and organize a party for birthday or celebration of any kind, or a work team building session. Weekend workshops will be arranged periodically. Please email Carole for information about future dates. Why not give that special person a unique gift? Gift vouchers are available; they can be exchanged for classes or one of Carole's ceramic works of art. Celebrating a birthday or just for fun,why not organise a special session at Clay with Carole. In your 3 hour session you will make, decorate and paint your pot or dish and Carole will glaze and fire it for you to collect later. Pottery Wheel Sessions, Family Activity Sessions, Childrens Parties, Team Building Sessions. Contact Carole for prices. Minimum 6 adults or 6 children for a party session. Carole runs classes in an informal, friendly manner, teaching individually or in small groups as students’ work and skills progress. A range of different ceramic, sculptural and decorative techniques are demonstrated and explained and technical information is provided as needed. 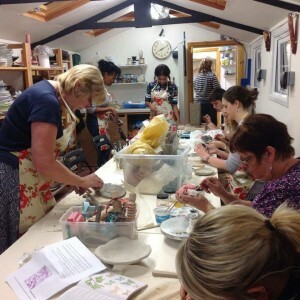 The Hitchin studio specialises in teaching hand building, decorating with colour and texture, combined with various firing methods in an electric kiln to create unique and individual pieces of art. These class times are a guide only – please email info@claywithcarole.co.uk or phone Carole 07770979889 for information about current and future dates.